First and foremost, I want to thank Derek and Julianne for creating this incredible show and going out on tour all over the country so that all of their fans can meet them and see what they do best, live and in person. This was a dream come true for me (and I bet for most fans of the Houghs) and I really couldn’t think of a better way of experiencing Derek and Julianne to the fullest. I have been a fan of Julianne’s since her first DWTS season with Apolo and thought she was just the most talented, energetic, cutest, and best dancer on the show… and then her brother came on the show… LOL! Let’s say Julianne got me hooked, but Derek has made me stay all these years and I have been a loyal and passionate fan of his since 2008. When the tour was first announced, I knew immediately than I would be going. I was willing to travel down to LA because I thought for sure that they would have a show there. I got to see Derek live last year at his California Philharmonic concerts, which were both in the LA area. So I didn’t mind if I had to drive again. I live in the SF Bay Area and I was so fortunate to have the opportunity to go to THREE shows!!! During the pre-sale, I got tickets to the San Francisco show (which I took my mom to). Then my friend Joanna (@raggydoll222) gets in touch with me and said that she was taking me to the San Jose concert with her! I went to a Calphil concert with Joanna last summer and this woman is so kind and generous as she has treated me to both the Calphil and the San Jose Move shows… I can’t thank her enough! Love u Joanna! 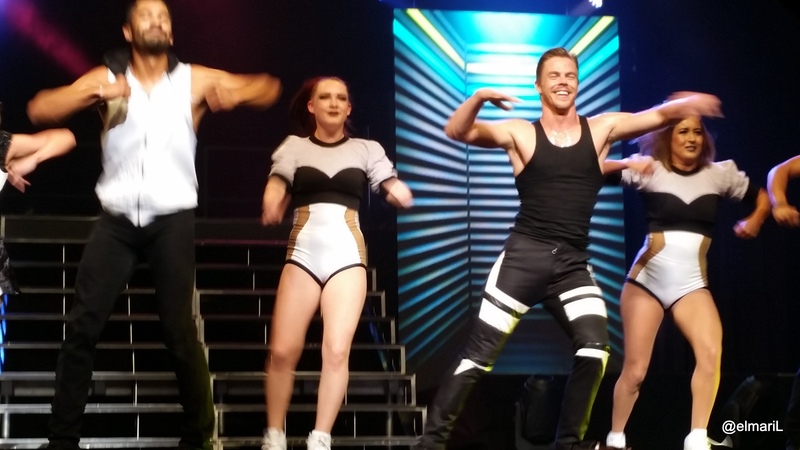 Since I’m the type of person that watches every video and looks at every picture that has to do with Derek Hough, I felt by the time that I got to go see my shows (practically at the END of the tour)…. I felt like I knew the majority of the show backwards and forwards! There were really no surprises for me, but that was my choice. However, the experience of seeing Julianne and Derek live, dancing and singing truly is amazing and inspiring. You can see how passionate and committed they are to entertaining the crowd every night. I had learned in hindsight that Julianne was not feeling well during the Santa Rosa and San Jose concerts and you all know Derek hurt his back the week before, but during the shows they were full out, giving the audience all of themselves, and truly being the best professional entertainers out there! I could really see how much they love to sing, dance, and perform for each other and for a live audience. Seeing Julianne dance again was fantastic for me for she is still one of my favorites and it’s truly her dancing that makes her so special to me. She is flawless in person, so animated, and so much fun to watch. Plus all 3 shows, I really got a sense of her appreciation, love, and genuineness in how she interacted with Derek and the crowd. I didn’t get to meet her after the show in Santa Rosa nor San Jose because she wasn’t feeling well, unfortunately. But you really couldn’t tell because she was giving 1000% during each show I went to. I think dancing and performing really are her strongest skills, though. She is so tiny… lol… I would have felt like a giant next to her if I took a pic with her! As for Derek, I mean, what can I say that all our other friends haven’t. Seeing him in CalPhil last year was a thrill, but then I felt like I didn’t really get to see him dance that much since it was only 2 dances with Emma and he sang 2 songs. But I know what he looked like performing live and in person. Watching this show, he’s giving the same commitment, dedication, performance quality, and passion that he does when he does DWTS… except it’s even more because he’s dancing with all professional dancers and it’s HIS show. Not to be superficial and in all seriousness, I was actually really impressed with how his body looks in person. Derek really did deserve that ‘Hottest Body of Work’ Award! Haha! He’s not a buff muscle head with all these big muscles, but I felt like every muscle in his arms, torso, stomach, and back were incredibly defined and JUST RIGHT. I guess that can be considered the “dancer’s body”, muscular and lean at the same time. His skin also looks so smooth and hairless, but his chest and arm hair are so fine and light that we just can’t see it. Yes, these are the things I notice and think about! I just wanted to mention that before seeing the show live, the performances I was most looking forward to were the opening number, Holy Grail, Paso Doble, Argentine Tango, Say Something, Shout, and Feel Again. I was truly surprised that the dances I loved the most were the “Kiss Me” rumba between Derek and Brittany Cherry and the “All of Me” contemporary between Julianne and Jason Glover. I have always wanted to see Derek do the full out horizontal rumba…. Umm, whoops… I meant, rumba with another professional dancer… LOL! This was a very romantic and sensual rumba (with a touch of humor at the end). But I remember tweeting this song (‘Kiss Me’ by Ed Sheeran) last summer or fall and saying that I would love to see him dance to it! Maybe I had a little influence on the show… lol, naahhhh… Derek and I probably just have similar taste in music. 😉 But this was like the “love scene” during the show for me and it was absolutely exquisite. I loved Julianne and Jason’s dance together because I had never seen Julianne perform contemporary before (and I was surprised to learn that it had become her favorite dance style). But what I saw her do in this dance reminded me of why I loved her dancing… she was fearless, emotional, incredibly detailed with each step. I really couldn’t take my eyes off of her. Not to mention Jason Glover is GORGEOUS and an incredible dance partner for her during this number. Watching the show 3 consecutive nights, I also wanted to point out that this is a very slick and highly rehearsed production. The cute moments that I thought were spontaneous were actually part of the show from Derek’s funny eyebrow raise after his la cucaracha during the rumba with Brittany to Julianne kicking Derek in the balls and him saying that she actually got him *this time*… the show was the same every night and the only big differences were the crowd interactions and dancing with the fans. The only thing different that I can think of was at the end of “Hey Pachuco” in SF (I think), the music got cut in the end and Julianne got confused and looked at Derek. This was the part where he is supposed to push her off stage and she falls into the arms of one the dancers, but they were both a bit confused and he slowly pushed/walked her off the stage…. LOL! Now a little more of the specifics of each city…. Santa Rosa was the first of my three shows and it was about 1.5-2 hours driving north for me from San Francisco and it was sold out. Andrea (@AndreaM1969) contacted me and wanted to meet up before the show. So we met at a restaurant close to the venue to get acquainted before she had to go do the VIP experience at about 4:45. It was very nice to meet Andrea as we talked about her other experiences meeting Derek during the DWTS cruise and meeting other DWTS pros like Maks, Tony, Karina, and Cheryl. She says Derek is the best in person… 😉 She was also going to San Jose and San Francisco shows, so I’d see her a few more times. =) Since I had time to kill before the show at 8pm, I drove around the Wells Fargo Center to look for the buses and I found them right away. I saw Nika outside on her phone, but no one else. I decided to park by the buses later on so it would be easy and fast to get to my car, since Andrea and I already decided to wait by the buses to meet Derek, Julianne, and the dancers. I killed time at Starbucks until I had to go back at 7pm. I must admit, there were a lot of older people waiting to enter the venue, but I’ve read throughout the whole tour that the demographic attending the shows are on the older side. But compared to SF and San Jose, there was more of the older generation here than the younger. Once I saw the entire audience, there were definitely people of all ages… so this really is a show that everyone in the family can enjoy. The theater was really intimate. I would guestimate a capacity of 2700 or so, but the audience was really loud and interactive during the show. I was seated in the middle, probably 6 rows from the stage. It’s a perfect theater for a play or acoustic performance. I sat next to some very nice women who loved them some Derek and Julianne. When I was looking around as everyone was getting seated, I turned around and saw Derek and Julianne’s mom, Marrianne, seating 3 rows back from me! We made eye contact for a second…. Then I turned back around and waved at her and told her “I love your kids!! !” and she smiled back and said thank you! LOL! What I remember most from this show is how fun Julianne and Derek were with the audience. Loved their audience competition where they pump up the crowd. There is video of that below. The women that Derek chose for Mustang Sally were also hilarious! I thought one woman’s top was going to slip down and expose something naughty… I think Derek was being very careful with her! I also loved when Derek would talk to the audience about his experiences. Check out the videos below! When the show was over I went up to the front row where Andrea was and I met some other Derek fans who were at VIP. One of them was Michelle (@Meeshlotus)! We used to chat a lot on twitter, but she told me she hasn’t been on twitter for a while. So if you’re reading this Michelle, get back on and play with us again! A super nice lady. It’s sort of strange that I am finally meeting people that I talk to about Derek all the time on twitter… LOL! But everyone I’ve met is fantastic. =) Andrea and I started walking out of the theater, when we saw Marrianne by herself, so we went over to go to talk to her. 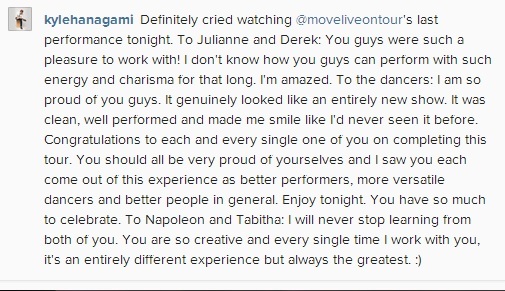 Derek and Julianne’s mom is the sweetest of them all…. beautiful, gracious, friendly, so proud of her children. I thanked her for raising her children so well and I said that Derek is so inspiring to me and that I sorta look up to him even though we are about the same age. She told us that Derek loves to inspire people, that it’s very important to him. I asked her if he would consider being in more movies and she didn’t really answer and mentioned his book tour and I think Blackpool (I’m not quite sure). It was really nice chatting with Marrianne and I got a photo with her! Andrea and I headed over to the buses and it ended up being a group of about 15-20 people waiting to meet Derek and Julianne, mostly female. The security had us waiting far away from the buses by the freaking dumpsters! The dancers could get to their buses without having to go through fans. Security kept discouraging us from waiting, but we knew that Derek would come out… and HE DID about an hour after the show ended. He came out with his super nice security guard, Armando. Derek was the ONLY person to come out to say hello to the fans. Some girls were asking about Julianne, but Armando said she was having her dinner (and I found out later that she hasn’t been feeling well). It would have been wonderful to meet Julianne, but I was mostly there to see and meet Derek ;-), so I wasn’t disappointed. It was dark and Derek was wearing a baseball cap, so I couldn’t see his features too well. But yeah, he is VERY handsome up close and in person. I thought I would be calm, cool, and collected…. No, I was reduced to acting like a 15 yo fangirl! LMAO! It was like I wanted to say so much, but my mind went blank… and then when something came out of my mouth, the wrong stuff came out… =P I honestly didn’t think I would get starstruck. But this is a guy I have admired for so long, exerted a lot of time and energy as a fan on him and I feel like I just totally embarrassed myself! Of course, he was so nice and cool about everything… he took a selfie with me and then I asked him to sign my tour program and my “Make Your Move” blu-ray. He looked very interested in seeing his movie and said that he hadn’t even gotten one for himself yet. He told Armando “We should watch this…” and smiled. He then moved on to sign autographs, take pictures, and chat with the others who were there. He stayed a few extra minutes chatting with all of us and did mention that they (he and Julianne) were going on a bigger tour next year… alluding to bigger venues and bigger stages (from what I remember). The biggest impression that I got from meeting and talking to Derek in person is that he is just so normal and unassuming. He is just a very normal guy that just has the ability to do many extraordinary things. He showed us he is very appreciative of his fans. He even asked Armando to bring Julianne some of the stuff us fans wanted her to autograph to her bus, so at least we would have that. Armando shortly came back with our signed photos and magazines by Julianne! That really made me smile! Thank goodness I took this day off because I was still so wound up with excitement from the previous night. This is the show that I went to with Joanna (@raggydoll222) and her friends. This venue was much larger than Santa Rosa and I think seats over 3500 people. This show was also sold out and there was a long line of people waiting to get in when I got there at about 6:45 pm. While I was walking from the parking garage to the theater, I ran into Armen Way!!!! I said, “Hi Armen!” and we talked for a few minutes. He noticed I was wearing a MOVE T-shirt and carrying the MOVE tote bag and asked if I had already been to a show. I said that I was going to 3 shows and he just smiled and laughed. He said after I’ve seen all the shows to tell him which show that I liked the best. He had mentioned that Derek and Julianne’s dad (Bruce) had also attended 3 shows and that he had thought Phoenix was the best they had performed. Armen said that they were all very surprised at that because they were incredibly exhausted from the two shows that they had done in Riverside the previous day… they were worried that they wouldn’t have enough energy for the show in Phoenix. They were so happy to get the overwhelming response from the fans at the Phoenix concert! We then took a photo together. =) Armen was extremely nice and so friendly with me. He asked if I would be waiting at the buses after the show and I said yes, to which he replied “Well, hopefully I’ll talk to you later.” =) Great guy! I met up with Joanna inside the theater and she was bubbling with joy and excitement over meeting Derek! She showed me her selfie with him and then we went inside to find out seats. Joanna was sitting front row center, by herself! (Btw, Joanna was the one that Derek sat on her lap and gave her a big hug to which Joanna told me later that she had his abs in her face and his sweat all over her!!!lol!) I was sitting with Joanna’s friends, floor level, probably 20 rows back… but she gave me the aisle seat! 😉 But what is hella funny is that I actually ran into some of my acquaintances from work at the show who were sitting in the 4th row center! I had told them about the tour when it was announced. They are big DWTS fans and Derek is their favorite. They told me they wouldn’t have known about the show if I hadn’t told them! Since I was quite far from the stage, I ended up watching the big monitors a lot, which was great because of all the close-ups. The crowd was super energetic and there was some really funny banter going on between some audience members and Derek! I have some video of that below. But what I remember very vividly is one of the women he chose for Mustang Sally…. She was really getting her freak on with Derek and she probably could have been his grandmother! She was grinding on him, she went behind him and started running her hands up and down his chest and stomach. I think she grabbed his pecks and then when he tried to get out of her grip, she started spanking him playfully! I mean, it was hellllla funny, but I don’t know what was running through his mind. Honestly, I felt like he was being treated like a piece of meat. =P Of course, he was laughing, smiling, and amused by it all… but man, that lady was a bold one! At the end of the show, when they all run up and down the aisles… I got to high-five many of the dancers and I got to touch both Derek and Julianne! After the show, I found Joanna up at the front and met @helenwhite00 and her mother from England. Personally, I thought it was incredible to know that many fans came from all these different countries to see Derek and Julianne on tour! We all walked out together to wait at the buses, hoping to meet Derek, Julianne, and the dancers. I found Andrea out there with a group of probably 30 people. Armen was already out there and chatting, taking pics, and signing autographs for the group. I told him that they were off the hook tonight and I enjoyed this show better because the audience was crazy! Probably 30 minutes later, out comes Ashley Galvan, Jake Kodish, Hayley Erbert, Jason Glover, and Paul Karmiryan. I got to chat and take photos with all of them except Jake. I was really excited to meet Paul and Jason because I really admire both of them so much! They were both so friendly and happy to talk with the fans. Paul is quite popular from his SYTYCD fame. Many girls out there wanted to meet him also. And OMG… Jason is so handsome and nice! About 15 minutes later, Derek came out to meet the fans. Everyone was so excited to see him and they asked him if Julianne would come out too. He told us that she had been feeling sick and that she had left the theater in a car already. =( He then proceeded to go around signing autographs, taking selfies, and chatting with the fans. There were a lot more people here than in Santa Rosa, but everyone got a little time with Derek. He took another selfie with me, but I saw that it was dark and not that good. I actually wanted somebody to take a picture of us, so I waited until a good time and said “Derek, can you take a real picture with me?” to which he sort of laughed and said “What’s a real picture?”… Ahhhhh, foot-in-mouth disease again!!!! LMAO! But he was nice enough to pose for a photo with me and I was really happy with this one. 😉 I didn’t want to take up too much of his time since I had already met him the night before. After he pretty much met everyone, he goes okay… I want to do a demonstration for you guys. Someone yelled “a dance demonstration? ?” and Derek said, “No, a hugging demonstration” and we all went oooooooooooh! Haha! Derek said that there is a better, more intimate way to hug people instead of just putting your arm around them and sort of loosely hug somebody. He said you should give people heart-to-heart hugs where you wrap your arms around that person and place your heart on theirs and it gives you more of a connection with each other. Personally, I think a lot of people just fell even more in love with him right then and there! He demonstrated the heart-to-heart hugs with a couple of young girls. He was standing rather close to Joanna and I and she was just looking at him with such awe that I just blurted out “Derek, will you give my friend a heart-to-heart hug?” and he said “Of course” and gave Joanna that special hug. We then thanked Derek for his time spent with us and he looked like he was getting ready to leave us at that point anyways. I got a few seconds of his heart-to-heart hugs with people, but I wish I got the whole thing because it was so special. This was a great night! This was my favorite show because of the seats (aside from the heads), the audience was fantastic and so much fun, I had my mom with me, and I just really enjoyed myself because I knew this was my last one. I saw Andrea up at the front row again and I think she was in the center… lucky woman! During this show, Derek brought his mom up on stage during ‘Mustang Sally’ and introduced her to the audience as “This is the woman who birthed us”…. LOL! It was cute when Julianne came out with her lasso and put it around both Derek and their mom. For ‘Save a Horse, Ride a Cowboy’, Julianne brought up 2 of her friends on stage, but ended up picking this guy named Juan Carlos who was very charismatic. But with one of her friends that she danced with during the competition, I thought his pants were going to fall off because they were hanging so low on his hips!!! That’s why guys… you need to wear belts or jeans that fit! Another fun tidbit from this show were these 3 women sitting in the front row on the left side who all had identical shirts that said DEREK on them. They must have been at VIP because Derek took a liking to them and had them stand up with him during ‘Mustang Sally’ and said ‘Now… who’s the real Derek?? ?” which was quite funny! Later on during ‘Great Balls of Fire’, Derek ran up and down the aisles and then went to those 3 women and literally laid himself across their laps for a good 10 seconds!!! He is so funny! At the end of the show, during ‘Dare You’, I was getting emotional because I knew my experience was coming to an end. Also, those dang bouncy balloons kept hitting my on the head! I had so much fun with my mom who absolutely LOVED the show. She was so happy… =) Since I had her with me, I didn’t wait at the buses which was fine with me because I already had great experiences the nights before. But I later found out that Julianne was out meeting fans that night… oh well, there is always next year! 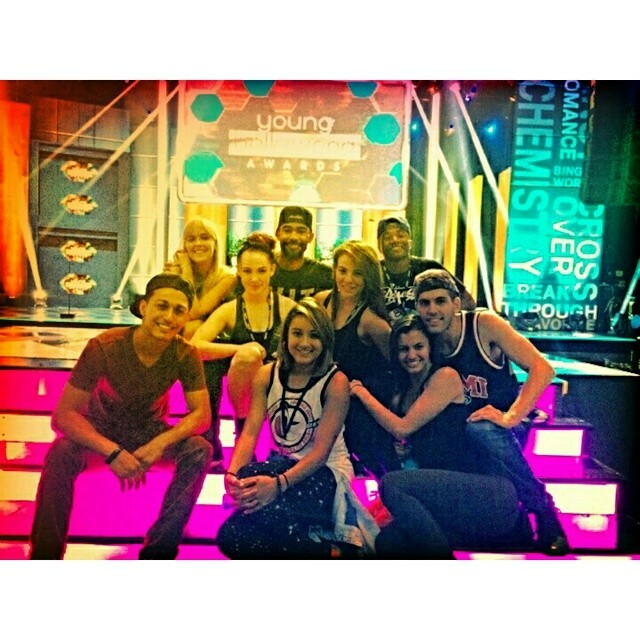 I have one more video that I want to share of Derek and Julianne introducing the incredible MOVE company dancers. I have not seen video of it, so I made sure to capture this moment! Thank you so much for reading and I hope you all enjoy the photos and videos! Tons of videos to come in the next post!!! As you can see from the miscellaneous photos below, a lot of the cast enjoyed sightseeing at the Golden Gate Bridge. Derek and Julianne’s mom was there and seemed to be finishing the tour with them… =) Julianne also had some friends in the audience and brought them up during ‘Save a Horse, Ride a Cowboy’, but ended up choosing a really fun and enthusiastic fan named Juan Carlos for her ‘Black Betty’ number! I mention him because I met Juan Carlos after the show and he was very nice to take a picture of my mom and I outside of the theater… LOL! Anyways, enjoy all the photos, tweets, fan photos and videos from the fantastic San Francisco show! Family friend Emron dancing on stage! 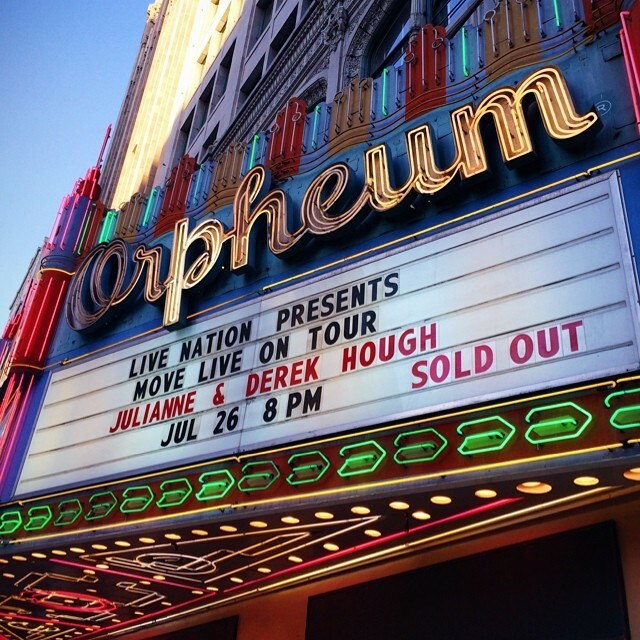 ‘Move Live on Tour’: San Jose, CA (07/24/2014) – Miscellaneous Photos, Fan Tweets, Photos, & Videos! 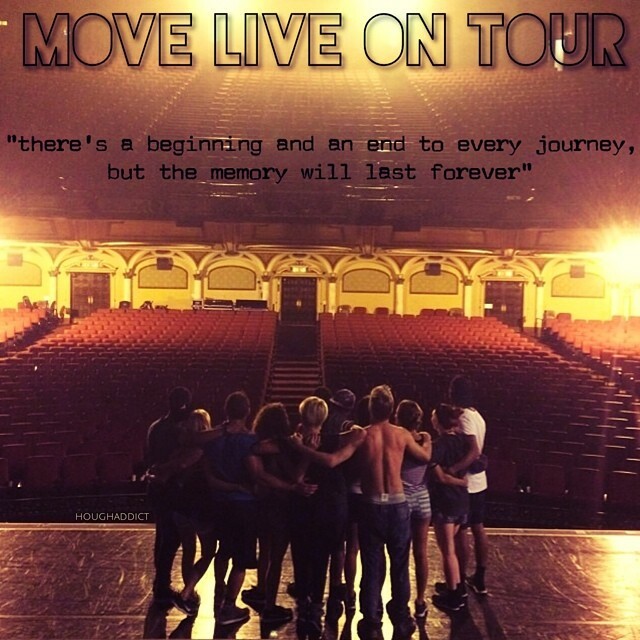 ‘Move Live on Tour’ headed to San Jose, California, for a SOLD OUT show at the San Jose Civic Auditorium on July 24. I went to this show with my good friend @Raggydoll222 and we had the best time! The capacity of the venue was over 3,600 and they had the full set on stage and two big monitors on other side of the stage. 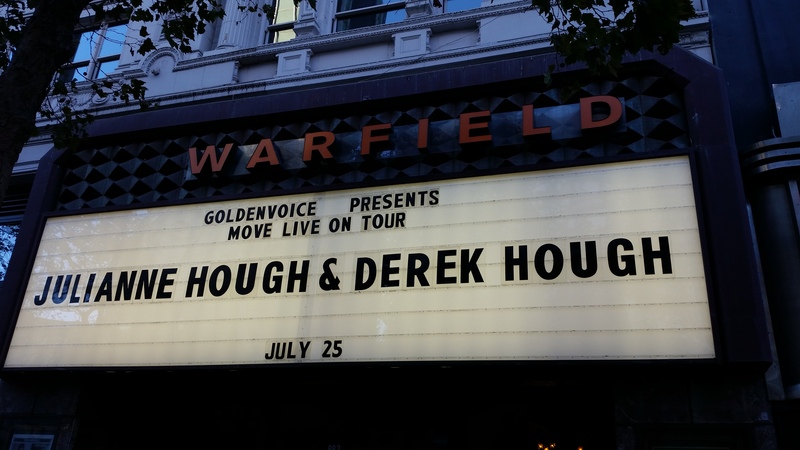 I was also lucky enough to meet Derek in person after the show, but more about that in another blog! 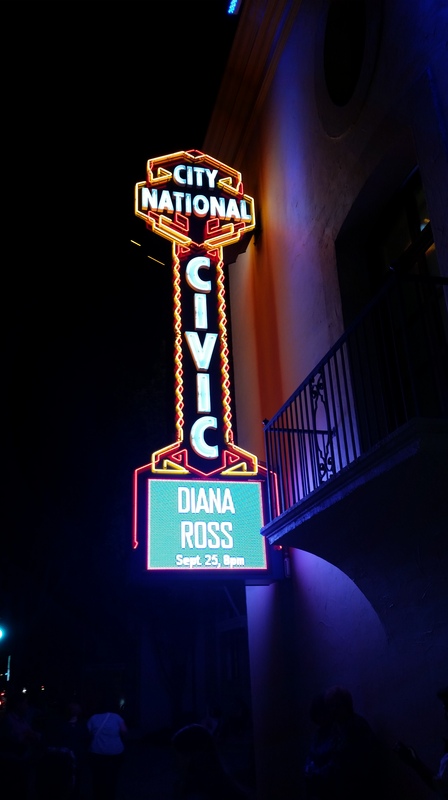 ‘Move Live on Tour’: Santa Rosa, CA (07/23/2014) – Miscellaneous Photos, Fan Tweets, Photos, Videos & More! 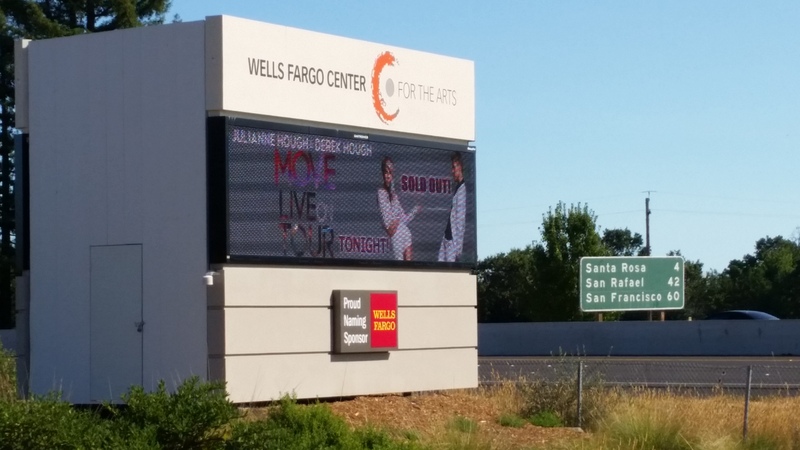 “Move Live on Tour’s” next stop was a SOLD OUT show at the Wells Fargo Center for the Arts in Santa Rosa, California, on July 23! Santa Rosa is located in the beautiful wine country in Northern California. 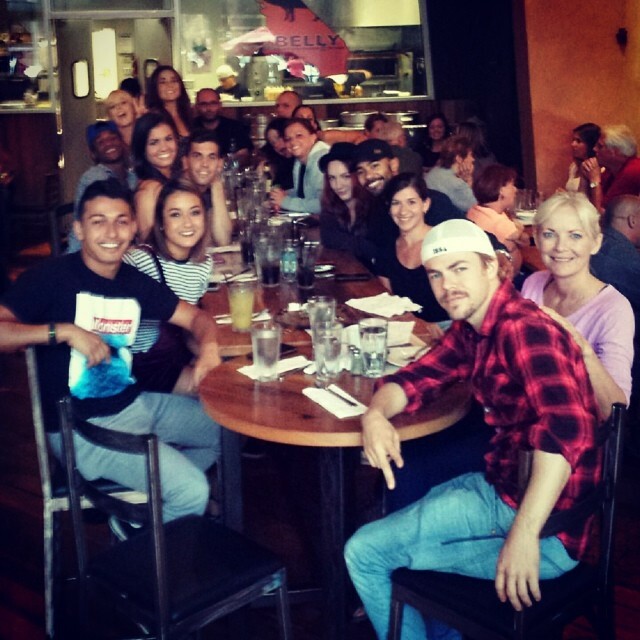 Derek, his mom Marrianne, Kristy, and the MOVE dancers all enjoyed a day out at a local winery. Check out the great pictures from their outing! Santa Rosa was the first of my three ‘Move Live on Tour’ shows and it was an incredible experience. I will share more of my thoughts, photos, and videos in a blog later on. Just know that there was a great, lively crowd and I got to meet Derek after the show! The theater felt very intimate, but it had a capacity to seat almost 1700 people. There wasn’t much stuff that was shared about this show, but I did find some stuff. Check out all the great fan photos, tweets, and videos below! 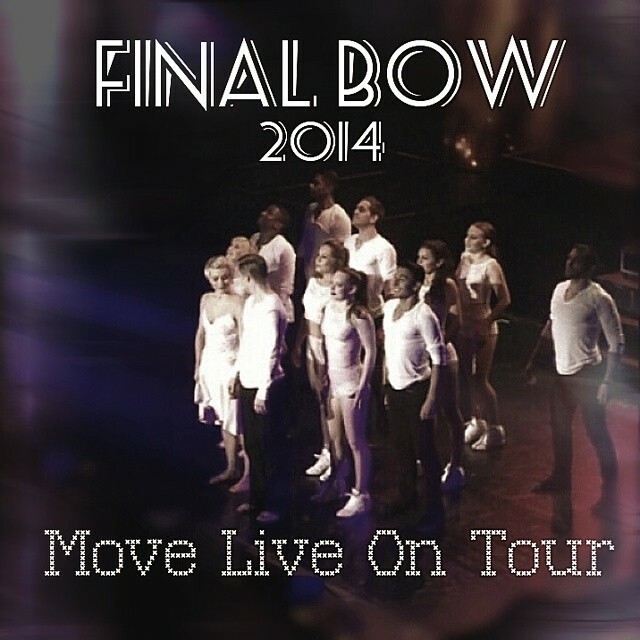 ‘Move Live on Tour’: Phoenix, AZ (07/20/2014) – Miscellaneous Photos, Fan Tweets, Photos, Videos & More! Derek singing Happy Birthday to Jules! Derek & Julianne Hough visiting Boys & Girls Clubs with Armen Way in Phoenix, AZ on July 20, 2014 – 26th Julianne’s birthday!!! Great atmosphere. We have learned some choreography and it turned to a freestyle circle. We did perform for a little , than the opportunity was given to the kids to show case their talent! So much fun!!!! Some very special moments during the show! Julianne hugging her dad Bruce… Aww!